Business is carried out with an aim of earning profit. It works as an incentive to the entrepreneur, for the risk taken and resources spent, during the financial year. Profit can be broadly classified as gross profit, operating profit and net profit. Gross profit implies the amount left over from revenues after deducting the manufacturing cost. It shows the firm’s efficiency in production and pricing. Conversely, operating profit alludes to the profit attained after deducing cost of production and operating expenses from the net sales. It helps to guage the overall operating effectiveness and performance of the company. Lastly, net profit denotes the amount of earnings left with the firm, after deducting all expenses, interest and taxes. It is a key indicator of company’s ability to convert sales into profit. Take a read of the given article to underdtand the difference between gross, operating and net profit. Meaning Gross Profit is the income of the company left after paying off the direct expenses. Operating Profit is the income of the company left after paying off operating expenses. Net Profit is the residual income left with the company after all deductions. Objective A rough estimate about the company's profitability. To know how well the company is allocating its resources on expenses. To know the actual profit made in a particular accounting year. Advantage Helpful in controlling excess costs. Helpful in eliminating unnecessary operating expenses. Helpful in knowing the performance of the company in a financial year. Gross Profit is the profit remained with the company after reducing all direct costs like material, labor, overhead from Net Sales. The cost of goods sold includes all those costs which are spent in the production and distribution of the product. It symbolizes that how effectively and efficiently the company allocated its resources so that the best possible result is achieved at a very low cost. Net Profit is the surplus (positive value) remained with the company after deducting all expenses, interest, and taxes. After we arrive at the Operating Profit, then the interest on long-term debt and taxes are deducted from it, which results in Net Profit. It discloses the present profitability position of the company. Along with that, it reflects the success and failure of the entity. 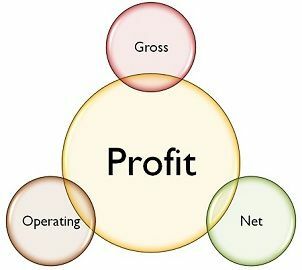 Key Differences Between Gross Profit, Operating Profit and Net Profit. Gross Profit is the income left after deducting direct expenses; Operating Profit is the income remained after deducting indirect expenses from gross profit and Net Profit is the net of all expenses, interest, and taxes. Gross Profit is the temporary estimate of company’s earnings, Operating Expenses shows the operating effectiveness of the entity, but Net Profit reveals the actual profit made during the year. Gross Profit helps in reducing extra costs. Operating Profit helps in the elimination of unnecessary expenses while Net Profit provides the overview of the current position of the entity. All are a part of the Income Statement. Helpful for the readers of the financial statement. The three types of profit, which we have discussed, are three stages of the Profit. The meaning of the three is very clear as well as there is no contradiction in understanding them. At the fundamental level gross profit exists which is followed by operating profit at the middle level and finally the net profit at the bottom level which is the finest form of profit as it arises after deducting all expenses, taxes, and interest. Great explanation. I needed to get on top of this quickly before meeting with a client and this was exactly what I needed.